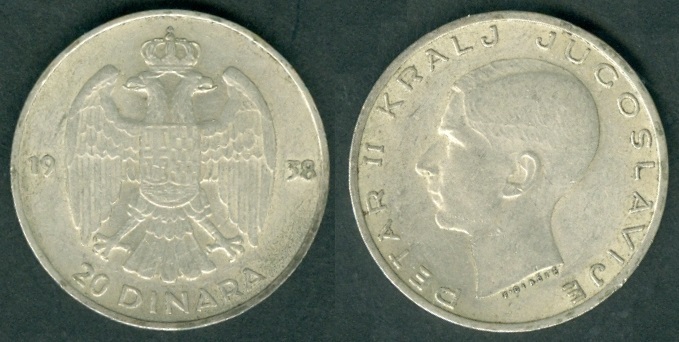 Petar II Karađorđević coinage: 1938. Peter II (Serbo-Croatian: Petar/Петар; 06 September 1923 – 03 November 1970) was the last King of Yugoslavia (09 October 1934 – 29 November 1945), and the last reigning member of the Karađorđević dynasty which came to prominence in the early 19th century. Peter II was the eldest son of Alexander I of Yugoslavia and Maria of Romania; his godfather was the British king George V.
Although King Peter II and his advisors were utterly opposed to Nazi Germany, Regent-Prince Paul declared that the kingdom of Yugoslavia would join the Tripartite Pact on 25 March 1941. Two days later, King Peter, at age 17, was proclaimed of age, after a British-supported coup d'état. Postponing Operation Barbarossa, Nazi Germany simultaneously attacked Yugoslavia and Greece on 06 April 1941. Within a week, Germany, Bulgaria, Hungary and Italy invaded Yugoslavia, and the government was forced to surrender on 17 April. Parts of Yugoslavia were annexed by Italy, Bulgaria, Hungary and Germany. In the remaining parts of the kingdom of Yugoslavia, Croatia and Serbia, two Nazi-puppet governments were installed. Peter left the country with the Royal Yugoslav Government's ministers following the Axis invasion. Initially the Yugoslav king and his government ministers went to Greece en route to British-ruled Jerusalem in Palestine, and then Cairo in Egypt. In June 1941, King Peter arrived in London where he joined numerous other governments in exile from Nazi-occupied Europe. The King completed his education at Cambridge University before being commissioned in the Royal Air Force. In 1942 he made a diplomatic visit to America and Canada, where he met American President Franklin D. Roosevelt and Canadian Prime Minister William Lyon Mackenzie King. The whirlwind tour was unsuccessful in securing Allied support for the exiled Yugoslav monarchist cause. Roosevelt and Churchill had already engaged the support of the Communist Yugoslav Government in the Allied effort to defeat Nazi Germany, with a view to ending the hostilities. Peter married his third cousin, Princess Alexandra of Greece and Denmark in London on 20 March 1944. They had one son, Crown Prince Alexander, who was born on 17 July 1945. Peter filed for divorce in 1953. He hired attorney René de Chambrun, the son-in-law of Vichy France Prime Minister Pierre Laval. However, the couple reconciled in 1955. Though the war ended, Peter was not allowed to return home. He was deposed by Yugoslavia's Communist Constituent Assembly on 29 November 1945. After that, he settled in the United States. From 1962 to his death he served as the Royal Patron of the Sovereign Military Order of the Temple of Jerusalem in the United States. After many years of suffering from cirrhosis of the liver, he died in Denver, Colorado, on 03 November 1970, after a failed liver transplant. He was interred in Saint Sava Monastery Church at Libertyville, Illinois, USA. On 04 March 2007,Crown Prince Alexander announced plans to have his father's remains repatriated to Serbia. Peter II had chosen St. Sava Serbian Orthodox Monastery as his interim resting place because of the extenuating circumstances that afflicted his homeland. After talks with the Serbian government, the move was confirmed in January 2013 with the burial place being the Royal Family Mausoleum in Oplenac. On 22 January 2013, Peter's remains were returned to Belgrade, Serbia. He lay in state in the Royal Chapel in Dedinje before being buried in the Royal Family Mausoleum at Oplenac on 26 May 2013 along with his wife, Queen Alexandra. His mother, Queen Marie, and his brother, Prince Andrej, lie nearby. The Serbian Royal Regalia were placed over Peter's coffin. Present at the return ceremony were the Prime Minister Ivica Dačić, Peter's son Alexander with his family, and Serbian Patriarch Irinej. Alexander openly advocated for the restoration of the Serbian monarchy. Currency: Dinar = 100 para. KM#17 / Schön#13 25 para. Year: 1938. Weight: 2.49 g [2.50 g]. Metal: Bronze; hole in the center. Diameter: 20.00 mm. Edge: Plain. Alignment: Coin. Mint: Belgrade. Obverse: "25" written at the top. "PaRa" written at the bottom with Date "1938" below it. Decorations on both left and right sides. Reverse: Crown at the top. "КРАЉЕВИНА ЈУГОСЛАВИЈА" (Kingdom of Yugoslavia) written clockwise starting from dot at the bottom. Wreath around the center hole. Mintage: 40,000,000 + N.A Proof. Mintage Years: One year type. Engraver: Frano Meneghello Dinčić (both sides). KM#18 / Schön#14 50 para. Year: 1938. Weight: 2.02 g [2.00 g]. Metal: Aluminium-Bronze. Diameter: 18.00 mm. Edge: Plain. Alignment: Coin. Mint: Belgrade. Obverse: Value "50 PaRa" written in the center. Date "1938" at the bottom. Decorations on both left and right sides. Reverse: Crown in the center. "КРАЉЕВИНА ЈУГОСЛАВИЈА" (Kingdom of Yugoslavia) written clockwise starting from the bottom. Mintage: 100,000,000 + N.A Proof. Mintage Years: One year type. Engraver: Frano Meneghello Dinčić (both sides). 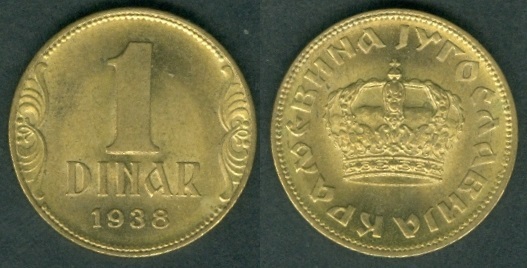 KM#19 / Schön#15 1 Dinar. Year: 1938. Weight: 3.53 g [3.50 g]. Metal: Aluminium-Bronze. Diameter: 21.00 mm. Edge: Plain. Alignment: Coin. Mint: Belgrade. Obverse: Value "1 DINaR" written in the center. Date "1938" at the bottom. Decorations on both left and right sides. KM#20 / Schön#16 2 Dinars. Year: 1938. Weight: 5.00 g [5.00 g]. Metal: Aluminium-Bronze. Diameter: 24.50 mm. Edge: Plain. Alignment: Coin. Mint: Belgrade. 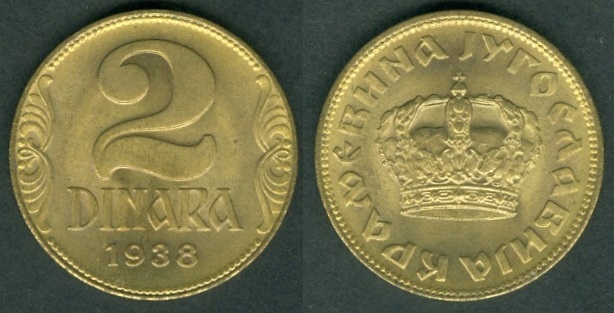 Obverse: Value "2 DINaRa" written in the center. Date "1938" at the bottom. Decorations on both left and right sides. Reverse: Crown in the center. "КРАЉЕВИНА ЈУГОСЛАВИЈА" (Kingdom of Yugoslavia) written clockwise starting from the bottom. Mintage: 74,250,000 + N.A Proof. Mintage Years: One year type. Engraver: Frano Meneghello Dinčić (both sides). Note: KM#21 2 Dinars also exists with small crown in the center of Reverse side. Mintage: 750,000. KM#22 / Schön#17 10 Dinars. Year: 1938. Weight: 4.99 g [5.00 g]. Metal: Nickel. Diameter: 23.00 mm. Edge: Reeded. Alignment: Coin. Mint: Belgrade. Obverse: Crown at the top. 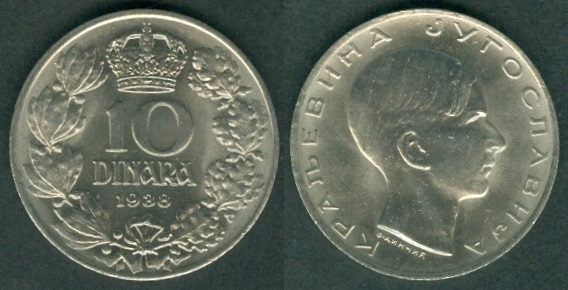 Wreath of two different plants - olive (left side) and oak (right side) surrounds Value "10 DINaRa" (10 Dinars) with Date "1938" below. Reverse: Peter II's portrait facing right in the center. "КРАЉЕВИНА" (Kingdom of) written on left side clockwise and "ЈУГОСЛАВИЈА" (Yugoslavia) written on right side clockwise. "Ф.ДИНЧИЋ" (F.DINCIC) written below the portrait. Mintage: 25,000,000. Mintage Years: One year type. Engraver: Frano Meneghello Dinčić (both sides). KM#23 / Schön#18 20 Dinars. Year: 1938. Weight: 9.00 g [9.00 g]. Metal: 0.750 Silver. Diameter: 27.00 mm. Edge: Lettered incuse: "BOG ČUVA JUGOSLAVIJU ***" (God protects Yugoslavia ***) written in Croatian language. Alignment: Coin. Mint: Belgrade. Obverse: Crowned Coat of arms of Yugoslavia in the center. 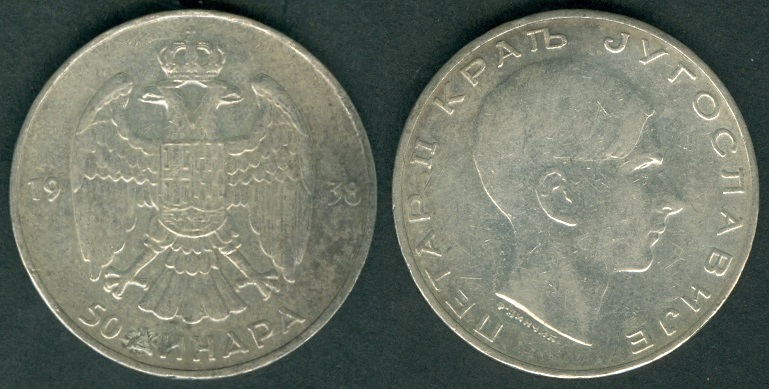 Date "1938" divided on both left and right sides. Value "20 DINARA" (20 Dinars) written at the bottom. Reverse: Peter II's portrait facing left in the center. "PETAR II KRALJ" (Peter II, King of) written on left side clockwise and "JUGOSLAVIJE" (Yugoslavia) written on right side clockwise. "F.DINCIC" written below the portrait. Mintage: 15,000,000. Mintage Years: One year type. Engraver: Frano Meneghello Dinčić (both sides). My coin has edge readable when Date side is at the top. KM#24 / Schön#19 50 Dinars. Year: 1938. Weight: 15.02 g [15.00 g]. Metal: 0.750 Silver. Diameter: 31.00 mm. Edge: Lettered incuse: "БОГ ЧУВА ЈУГОСЛАВИЈУ" (God protects Yugoslavia). Alignment: Coin. Mint: Belgrade. Obverse: Crowned Coat of arms of Yugoslavia in the center. 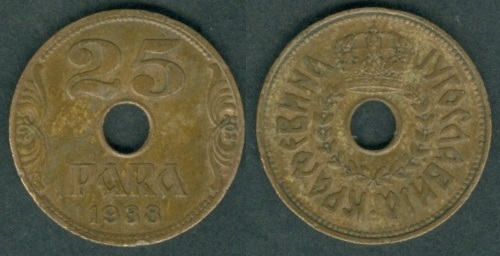 Date "1938" divided on both left and right sides. Value "50 ДИНАРА" (50 Dinars) written at the bottom. Reverse: Peter II's portrait facing right in the center. 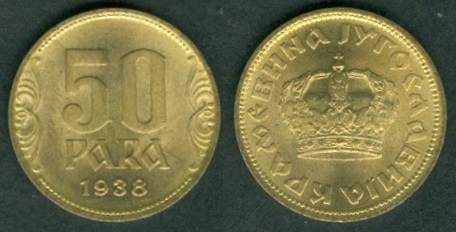 "ПЕТАР II КРАЉ" (Peter II, King of) written on left side clockwise and "ЈУГОСЛАВНЈЕ" (Yugoslavia) written on right side clockwise. "Ф.ДИНЧИЋ" (F.DINCIC) written below the portrait. Mintage: 10,000,000. Mintage Years: One year type. Engraver: Frano Meneghello Dinčić (both sides). My coin has edge readable when Date side is at the top. Actual Ottoman rule: 1389-1717, 1739-1789, 1791-1804, 1813-1817. Governors at Niš 1719-1739.